“Among His Signs Is That He Created Companion ( Mate, Spouse) For You From Among Yourself, So That You May Find Tranquility With Them, And (He) Set Love And Mercy Between You. Surely In This Are Signs For People Who Give Thought” Surah Ar-Rum, 21 (Quran 30:21). Now there is a saying that loves cures everything however for those who are married for years knows that this phrase is not entirely true. There is hard work involved in a marriage and there is planning too. One needs to improve themselves in many areas such as communication, family planning and more. 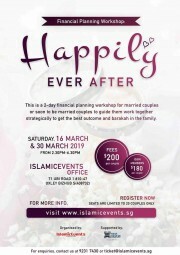 In this upcoming course, ‘Happily Ever After' is design to guide couples to plan their family finances to achieve “Barakah” in their lifetime. What do we mean by “Barakah”? It is difficult to explain the meaning of Barakah in English. If you google it, you can find that it mentions about divine blessings but there is more to it. To achieve this, there is plenty to do beside your own Ibadah like solat 5 times a day, fasting and doing charity. Yes there is more to it. Earning an income and spending money can be an ibadah if we do it correctly and in a lawful (halal) way. And if done right, the money you earn can also grow. This is barakah. Now, let's get to reality. All of us have desires and dreams. vi) and many more right. I) start to loan money from banks or use their credit cards over their limits to buy this “Now”. ii) could not foresee the potential payments to be made such as children schools expenses, income taxes, house renovations. iii) do not take the steps when either one of the partner is out of job, retrenched, fired and cannot find one immediately. iv) faces health issues in the family. Hospital bills goes beyond one's means. So do you agree that to live Happily Ever After, you need to plan your family finances well? You will go through different phases in marriage. 1. Among the biggest hurdle is your own wedding itself. 2. Purchasing a house or car in Singapore. 3. Expecting your first child. 4. Having Expenses when you have 3 people or more. Family planning is not a fixed plan. Along the way there will be surprises such as expecting a child so there are plenty of adjustments to be made every year. 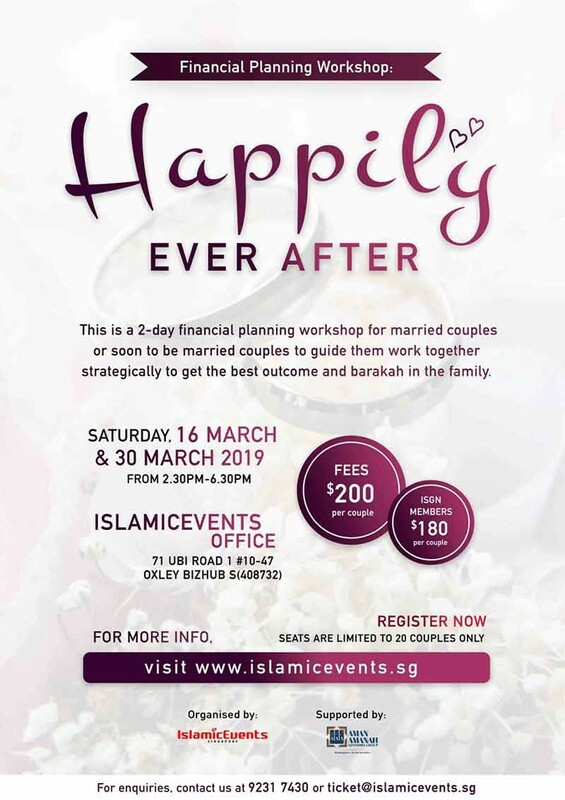 So what this course will help you is to strategically get you and your partner to work together to get to the best outcome as possible and at the same time aiming to achieve “Barakah” in the family. He has been around the financial industry for over 18 years and he has switched from main stream to Islamic financial planning since 2013. Planning for the rich is very simple he said because they already have existing money to work with however the challenge is with those of middle and lower income. He has helped to strategise for many couples to purchase a house and helped them achieve their goals. It's not impossible he said but it requires one to make sacrifices and patience. Especially in Singapore, this will never happen overnight. It requires the couple to be discipline in their savings and spending over a period of time and when the time is right, they will put their resources in the right places where it will benefit them. 1. Where did your money go? - It starts with the individual and understanding of how money affects your life. 2. Then there is 2. - When there's 2, how do you split expenses ( if both working) and do you need a joint bank account? If one spouse is not working, then what's the next step? - This home work is meant for couples to observe their spending habits. - Identifying spending habits that may developed over the years and how to improve on it. - To be debt free and clear of RIBA is possible in Singapore, however the journey is not easy. Learn the strategies and apply them. 3. How to overcome surprises and protect your family. - Introduction to various Islamic Financial Programs out there. 4. Start building your family's legacy. - We will all end up in the grave one day and the family members will be the one inheriting your wealth eventually. Start this right from the day you are married and insyallah the people that is close to you will benefit from it when you are gone. Not an IslamicEvents.sg member yet? * Price inclusive of notes. * Tea Time is provided. 4) Participants are to attend the course punctually and inform organiser early if they are late. 5) Organiser has the rights to make changes to the schedule or cancel the course. Participants will be informed in advance for changes. - Please call our HOTLINE @ 9231 7430 during office hours to arrange an appointment for payment. Our office operates from Monday to Friday, 10.30am to 6.30pm. We are closed on Saturday, Sunday and Public Holiday. Step 3: Choose your mode of payment and proceed with payment.